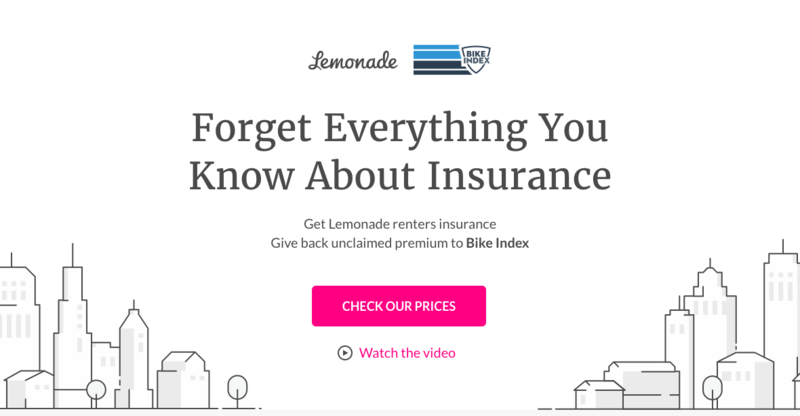 Bike Index’s newest partnership with Lemonade - the renters and homeowners insurance company that actually enjoys paying out claims - began with a tweet. And a shared appreciation for tech’s ability to provide super simple solutions for things. We have been wanting to partner with an insurance company for awhile now. After all, a huge part of our mission is to recover stolen bicycles by way of protecting them. The best way to recover bikes is to prevent theft in the first place. When theft inevitably does happen, we work to recover your bike. Sometimes this doesn’t happen. But with an insurance company protecting your stuff, you could still recoup the cost of the loss, while replenishing the donations to your favorite charity (us 😀). The problem is that many bicycle insurance companies say they’ll help you out, but then you spend months going through the process of trying to convince them that the theft was real, and you didn’t just accidentally run over your frame in the driveway. So we decided to go a different route: renters and home insurance powered by AI and behavioral economics, instead of bicycle insurance. We surveyed a bunch of Bike Index users and their results indicated that insurance was something the average user might be interested in. Bike Index and renters insurance can both do a couple of things to get people back out and on the road in the case of a theft: 1) They can actually recover the bike or 2) they can return the lost cost of the stolen bike so that you can get a new bike. But almost more importantly, they give cyclists security and incentivize them to spend the money on the bike that will best suit their needs. Too many cyclists are deterred by the low-quality bikes they are tempted to buy because they’re afraid a more expensive bike will be stolen. With insurance and Bike Index, cyclists know there is an extra layer of protection between them and the thieves who could steal their main means of transportation. The problem is, either people don’t know about Bike Index, or they don’t know about a good renter’s insurance company. A partnership with Lemonade will bring Bike Index users to a great insurance group, and show currently insured renters Bike Index's additional layer of protection. A ton of Bike Index users that we surveyed, whose bikes had been stolen, were interested in receiving theft-related deals from Bike Index. I used to work at a bike shop. My co-workers sold a friend of mine a bicycle. I asked her how she had been enjoying riding it and if she was worried about getting it stolen in the city. She said no because she had this awesome renter’s insurance that protected her bike, even when it wasn’t at home. The insurance was called Lemonade. I looked it up and went through the renter’s insurance quote process, stopping right before the end, because I already had renter’s insurance (although Lemonade helps you switch quite easily and quickly). The whole process took me about two minutes. And covering all of my items was just over $12 a month. 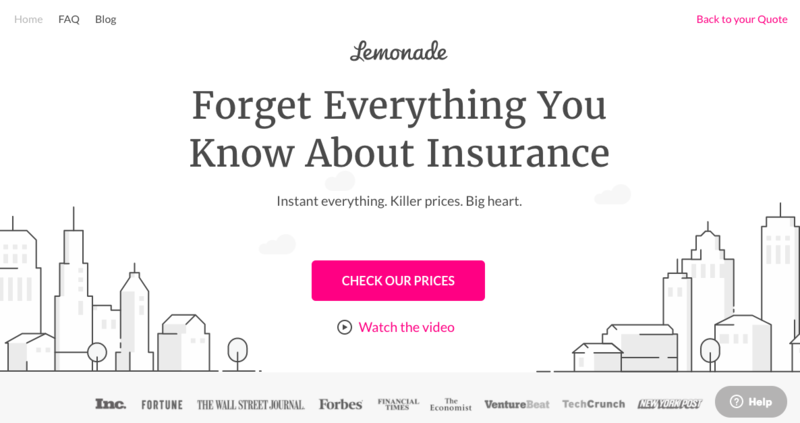 Lemonade’s interface is super clean and simple, which was a nice contrast to the usual renter’s insurance forms that you spend 20 minutes navigating and another 45 asking your parents for all the field information. Lemonade covers bikes worth up to $3,000, which is pretty significant. Most stolen bikes are worth between $500 and $1,000, which is well within the range Lemonade will send you if your bike is stolen from your apartment or beyond. Additionally, Lemonade donates to charities of your choice. So if you setup Lemonade from this link Bike Index will be selected as your charity of choice. They charge a flat fee for insurance, pay back premiums super quickly, and any money that’s leftover will go to Bike Index, or whichever charity you decide to benefit, should the occasion arise. Right now, Lemonade is in California, New York, New Jersey, Texas and Illinois. You can add yourself to an e-mail list to get a notification of when Lemonade is going to roll out in your state.